Natural horse nutrition can help your horse from the inside out. Remember that your horse is a unique individual and what works for one horse may not work for another. Find the right balance for your horse and you will discover a happy and healthy horse using nutrition the natural way. If your horse has health issues, it is possible that their nutrition is lacking quality nutrients and/or they may not be able to absorb and utilize the nutrients properly. Just like people, your horse’s body may have become overloaded with toxins – even a build up of medications can compromise their immune system. Natural horse nutrition simply means providing your horse with the most natural and balanced diet as possible. Many people do not realize how simple changes in diet ingredients and the right supplements can make a world of difference in the health of your horse. 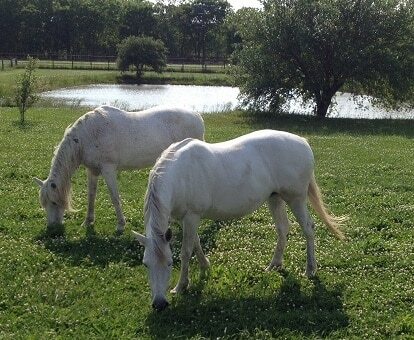 Natural horse nutrition can also help other holistic remedies and therapies be more effective. Of course, the key to nutrition is muscle testing. This way you can find out what is ideal for your horse. Feeding the wrong food items can result in health problems and behavioral issues. Whole grains like oats and corn are more easily digested by horses than other natural horse grains and that if you want to feed the best quality grain, you should only use USDA grade 1? Click here to find out more about the benefits of feeding whole grains, an important part of natural horse nutrition. Natural horse vitamins can help defend against free radicals but often horses lack vitamin C and E, even those that are already receiving supplements and/or have access to pasture? Click here to find out more about the benefits of feeding vitamins. Minerals are an important part of natural horse nutrition but your hay should be analyzed to determine the mineral levels prior to selecting a natural horse mineral supplement so you are not feeding low dosages or overdosing minerals? Click here to find out more about the benefits of feeding minerals. Natural horse herbs can help their body utilize nutrition and aid digestion? Click here to find out more about the benefits of feeding herbs. Natural horse spirulina/blue-green algae can help improve coat, hooves, and immune system, can help as a blood builder and detoxifier, and is especially good for horses that do not have access to pasture? Click here to find out more about the benefits of feeding spirulina. High sulfur garlic not only can help repel flies and mosquitoes but is also one of the world’s most powerful antioxidant foods? Click here to find out more about the benefits of feeding garlic. Bee pollen contains whole food antioxidants, vitamins, and minerals, and can help your horse build muscle, improve condition, and maintain a healthy blood count? Click here to find out more about the benefits of feeding bee pollen. Horse probiotics can help horses that are having problems maintaining their weight, have intestinal problems, and are on or have been on antibiotics? Click here to find out more about the benefits of feeding probiotics. Consider becoming a member of our Animal Heart & Soul Learning Center and learn all about how to create the best diet possible for your horse. Click here to learn more about the Animal Heart & Soul Learning Center. The Learning Center also offers online in depth courses at a special member price. Nutrition is the is the key to an animal’s healthiest, happiest and longest life possible. If would prefer to have the nutrition determined for your horse instead of learning how to do it, we do offer nutrition consultations.